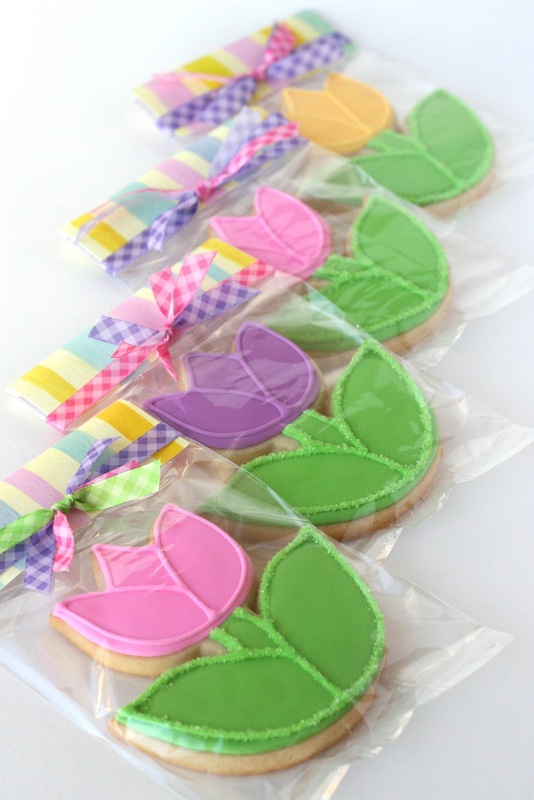 Spring flowers… and pretty cookies, two of my favorite things are even better together! 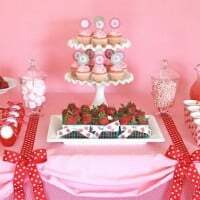 Kick off spring with this fun project, and then share some spring sweetness with your family and friends. 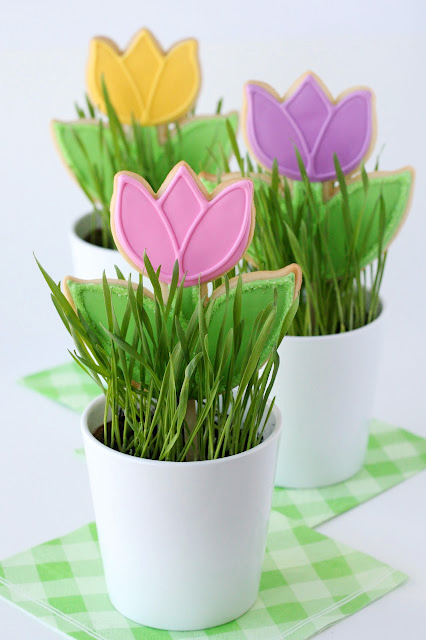 These adorable Spring Tulip Cookies are sure to brighten anyone’s day! 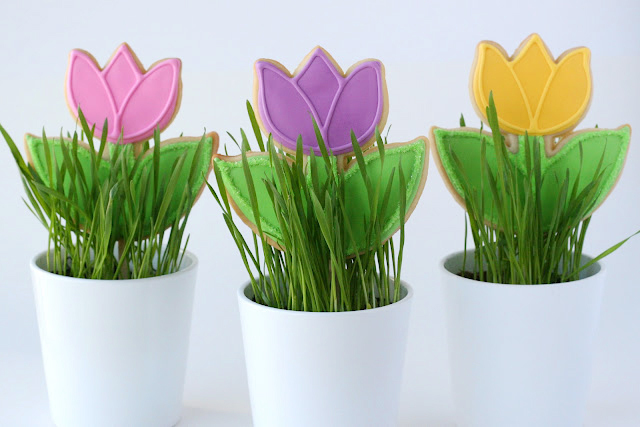 With just a few bags of icing, you can create these simple, yet beautiful tulip cookies. Note – This post was originally published in 2012. A step by step decorating video was added in 2019. You may notice slight differences, but both should be helpful in inspiring you to create some pretty spring cookies! First you’ll need a batch of cutout cookies, made with my Perfect Sugar Cookie Recipe. The cookie cutter shown was from Crate and Barrel last year, but here is a similar one from Copper Gifts and a cute smaller one from LC Sweets. Prepare a batch of Royal Icing. Color the icing as desired (I made green, yellow, pink and purple). For the cookies shown I prepared just one bag of each color, and thinned it to a medium consistency (a line drawn through the bowl of icing heals in 15-20 seconds). 1. Outline and flood the stem and leaves. Repeat with several cookies to allow this area to set up a bit before adding the next color. 2. Outline and flood the tulip flower. Allow the green base and colored tulip flower to dry completely before moving to the next steps (6-8 hours). 3.- 4. When the base icing is dry, outline the green leaf and stem. Place the cookie on a paper plate and sprinkle with green sanding sugar. 5. Shake off excess sanding sugar, or use a small, dry paint brush to dust off and excess sugar. 6. Outline the tulip flower as desired. Allow to dry before packaging. 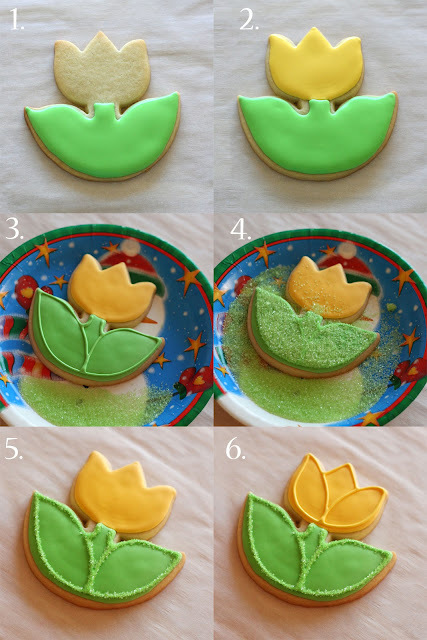 *Note- If you don’t want to wait overnight before finishing the cookies (as is necessary to copy this exact design) feel free to skip the sanding sugar, and simply outline the stem and leaves with green icing. This can be done after the base icing has dried 1-2 hours, and is set. To create cookie “pops” as shown in the photos above, you can bake a cookie stick into the cookies as I’ve shown HERE, or you can simply use a bit of royal icing as glue to attach a wooden coffee stir stick to the back of the cookie. Below you can see how I packaged some of the tulip cookies to give as little gifts. I’ve done complete posts on this style of decorative cookie packaging HERE and HERE. I am always so impressed with the beautiful and precise detail of your decorating. Just beautiful!! Beautiful cookies! They are perfectly simple, elegant, and springy! Thanks for sharing. These are absolutely stunning! Perfect for spring! they are so cute, just adorable, and I think I could even do them. Well with wriggly lines, but still, I could! So perfect for Spring…love it!! I love the cookies, and I love the packaging! So pretty! These are PERFECT! I especially love the sanding sugar. Glory – I don't know how you do it, but EVERYTHING you do is SO PRETTY!!!!! 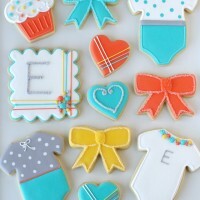 I just love your photography, the colors you use in your cookies, your packaging, everything!! What a wonderful idea! 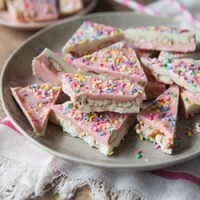 Love the colors you used, they look absolutely delicious and delightful!! They are beautiful, Glory! I need to make some for my tulip-lovin' daughter! These are so pretty, Glory! Lovely cookies, the colors, the presentation and how you pack all of them are so beautiful. You are starting spring, I'm starting autumn, but flowers are always welcome. I'm so ready for Spring! These help a lot! So pretty. Very pretty Glory but I have to say tonight I could use one of the cocolate cupcakes from your banner. I love these they are so pretty and cute!! These are super cute Glory! I am dying to dive into the pastels for spring, it's my favorite. As far as the bagging, I have tried your method twice now and have had such a hard time.. they turn out so nice it ends up being worth it, but I don't think I could do more than 2 doz or so like that! You are so creative! I love how cheery all your posts are. This gives me the spring fever. I just adore these cookies! They are so pretty for spring and I love them in the individual wrappers. So cute! tulips are my favorite flower. these are just beautiful. This is so cute, Glory!! I love the little baggies you made for them! So adorable! Just have to share this link on our FB page. Happy spring! I really like the wrapping too. Beautiful! I have so much practice to get in with royal icing. 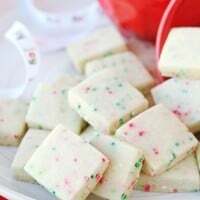 These would be a great cookie to start with. 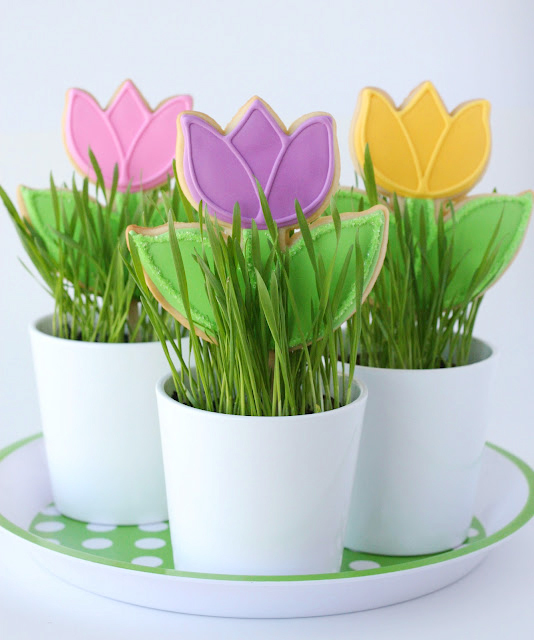 I love these cookie flower pots! I was wondering what exactly you used for grass or where you found it. Thanks! Can anyone tell me how the flowers made of candy (looks like m&m’s) are accomplished?